However, none of that means I can’t try to optimise my touring load, to make it as aerodynamic as possible. That’s right, I’m not racing, I’m touring. 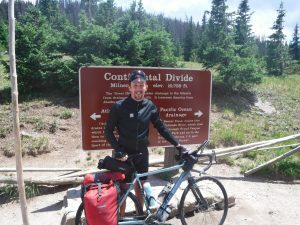 I’m going on a gentle bimble between the cafes of the world and I’m trying not to get out of breath while doing it, so anything I can do to make the inter-cafe rides easier and less taxing is great. 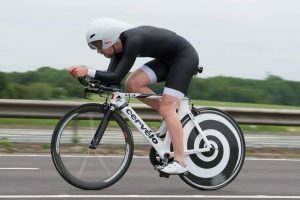 Racers call aero improvements “free speed”. I prefer to think of them as “free cafe time”. Okay, that last part was a bit smug. In all seriousness though, perhaps if you’re in Europe you can just go a bit slower and stop a bit more frequently. When I was in the desert in Nevada though I had to ride nearly 100 miles between water stops and that situation is starting to repeat itself as I get further north in Canada, with the added factor that in trying to get up to Anchorage and then down to Japan before winter closes in. If you’re in the more remote parts the world, the ability to cover ground quickly and efficiently becomes increasingly important – at least unless you want to carry an awful lot of stuff. So what can you do to make a touring bike more aero? First there are the obvious ones of using drop bars and wearing Lycra, which are both ignored by a surprising number of tourists. Come on guys, you’re on a road ride, wear the appropriate kit. I’ve made some improvements along the way that I hope (though I don’t really know) will make me a more streamlined tourer who can cover each day’s ground in an easier, more relaxed style and still have the energy to read my book in my tent at night. Okay these aren’t a change, but tribars are great for touring, I don’t know why more people don’t use them. They give you another position that takes the strain of your wrists and elbows, they give you somewhere to hang extra stuff (more on that later) and to cap it all, they make you super aero! Panniers are pretty much the easiest way of carrying large amounts of stuff on a bike, so it’s a shame they’re the least aero thing next to dragging a parachute behind you. Since I started I’ve gone from since full-size rear panniers to since smaller front panniers to try to mitigate this, and carried more in other bags elsewhere. When I was looking for smaller panniers I looked up data for the dimensions of all the major brands to find the longest thinnest paniers I could – the best ones turned out to be the standard Ortliebs. They’re still pretty short and fat so surely there is a market opportunity for someone here? My luggage rack is a Tubus Vega, which is the narrowest of the racks I could buy that I’d trust for a world tour, though it still ain’t thin. Narrow racks tend to be lightweight flexy things while full-strength touring racks tend to inexplicably be massively wide. Another marketing opportunity for someone, perhaps? Anyway, the Vega includes some extra, lower wider rails so you can mount your panniers on those and still tie a bag to the top of your rack. I used to use those but now I’ve worked out a strapping system where I can mount them to the top rails and still have a top bag. 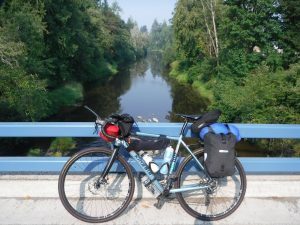 That moves the panniers inwards and also upwards, which means they’re sitting more in the wind shadow of my body and less in the clean air below my feet. When I set out in had my tent tied to the top of my rack. 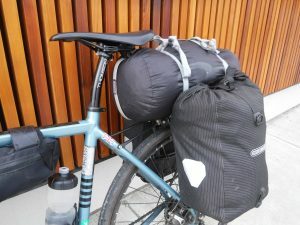 I’ve now strapped it beneath my handlebars, which creates space for another bag containing all my clothes to go on top of my rack, which allows me to use the snake panniers. 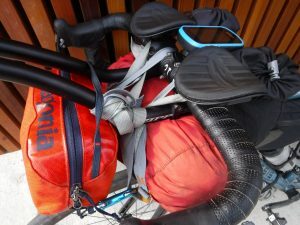 The bar bag is quite fiddly to access but it contains my tent, sleeping mat and a spare tyre, i.e. items I need either once a day or never. An added benefit of the tribars is that they space the bag away from the handlebars so I still have something I can hold on to! In the last couple of photos you can see I’ve actually put an extra bag on the bars to replace the small black saddlebag that I used for my fast access stuff: wallet, rain jacket etc. I’ve now retired that – it was about ten years old – and switched to the orange one that hangs over the tribars. A minor benefit of this is that I’ve been able to fit a bigger rack top bag behind the saddle but the main benefit is that I can now see this bag, so am more likely to notice if I leave it in a cafe! I used to be reticent about frame bags as I ride quite knock-kneed but I’ve quickly adapted, and to be honest if it trains me out of that strange pedalling style then that’s probably a good thing. I keep all my tools and spares in here, which again frees up space in the panniers so they can be smaller. So that’s it! Getting smaller panniers, shifting them inwards on the rack and getting a grand bag and bar bag to carry the extra stuff I can’t fit in the panniers anymore. Could I do anything differently? Apart from ditching half my stuff you mean? Well yes, I could get the version of my rack Rudy doesn’t have the outriggers at all, which would move the panniers in another few mm. They’re expensive though – about £100 – so I shan’t body unless I see another tourer who wants to do a swap (I’m definitely looking for that though!). Another thing I could do is to fit a frame bag that takes up the entire inside of the bike’s main triangle, as there’s still quite a bit of unoccupied space between the bag and the bottles. 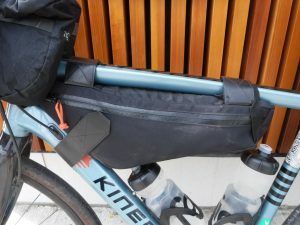 I’d then need to put the bottles somewhere else – you can put a water bladder inside the frame bag but I’d prefer to put them in a mount behind the saddle, which would take a bit of space away from the rack bag but I think I’d gain overall. Full frame bags are pretty expensive though, and I’ve already spent enough money rejigging my kit so that one will have to wait for another tour. No matter how aero I get though, I’ve still got to push the pedals. Oh well.